(8-CD set + 284 page book) Today Nashville is one of the three major recording centers in the United States, and has become what it has long proclaimed itself to be: Music City USA. The music, though, is predominantly country, which obscures Nashville's illustrious early reputation as one of the South's focal points for blues, R&B, jump jazz, and gospel. (Previously deleted:10/1/10. Original release date:10/24/00) In 1945, Nashville had no pro-quality studios, no career session men, no record companies, and only one or two music publishers. The city's independent labels played a large role in its transformation. Bullet Records, Tennessee and Republic Records, Excello and Nashboro Records, Dot Records, Hickory Records, and a handful of others recorded country, pop, gospel, and R&B, captured a vibrant local scene, and reflected Nashville music as it really was. This is their story. The indie labels often had strong R&B catalogues, taking advantage of local stations WLAC und WSOK, whose R&B programming was heard clear across eastern North America. 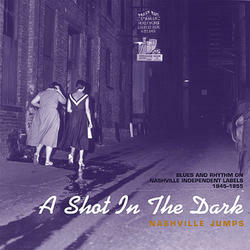 The 8-CD black music set, 'Nashville Jumps: Blues And Rhythm On Nashville's Independent Labels 1945-1955,' focuses (of course) on the blues and R&B scene of that period. It includes classics from Cecil Gant (I Wonder, Nashville Jumps, Boozie Boogie, Sloppy Joe's), Wynonie Harris (Lightnin' Struck The Poorhouse, Dig This Boogie, Drinkin' By Myself), St. Louis Jimmy (Goin' Down Slow), Red Miller (the #1 R&B hit Bewildered), Guitar Slim (Certainly All, Feelin' Sad), and The Big Three Trio with Willie Dixon (Get Up Those Stairs, Signifying Monkey). Also included are the first two ultra-rare singles by blues legend B.B. King, recorded for Bullet in 1949, as well as two records later covered by Elvis Presley, Bernard Hardison's Too Much and Arthur Gunter's Baby Let's Play House. Fabulous local legends like Christine Kittrell, Don Q. Pullen, and Louis Brooks are also featured. The set contains a full-length book. Part one, is the story of the Nashville music business from 1945 to 1955 by Martin Hawkins; the second part comprises song-by-song notes and artist bio's for each individual box by Colin Escott and Martin Hawkins. They include hundreds of rare photos and compelling first-person accounts of Nashville's earliest days.